IT IS OUT IT IS OUT!!! The movie is going to be released next year!! THE WARRIORS MOVIE OMFG!!!!! Well....no. hah. It won't... I guess I couldn't fool anyone, though. Ah well, anyways. 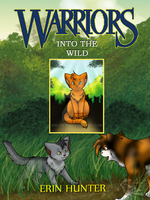 This is my contest entry for the contest: Design a fake Warriors movie poster. I hope you don't mind the blood I love blood! Oh well, please comment if you like it! Everything took me 3 days of hard work, maybe 12 hours in total. I drew EVERY SINGLE FRIGGIN FURHAIR!! I thought it was real until I read "Well....no. hah. It won't... I guess I couldn't fool anyone, though." What art system do you use? I want to find a good one so I decided to ask my role models in art. 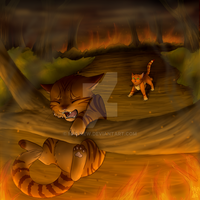 No bluestar!! Let him die!! LIVE!! LIIIVE!! 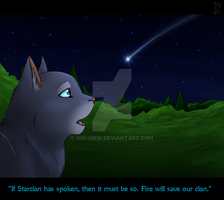 D,: I wish bluestar was immortal or something, she was my favorite. I suppose so, at least she received a great death scene. I KNOW RIGHT. THey shall make one soon!! They're seriously making a movie?! Ohh. I wish one would come out! Those would be amazing - - only if they followed the plot/storyline, though.. I hate how so many movies get ruined! I know, but it would still be awesome! Maybe you could make/animate one!